Transform your festival experience into a shared experience. 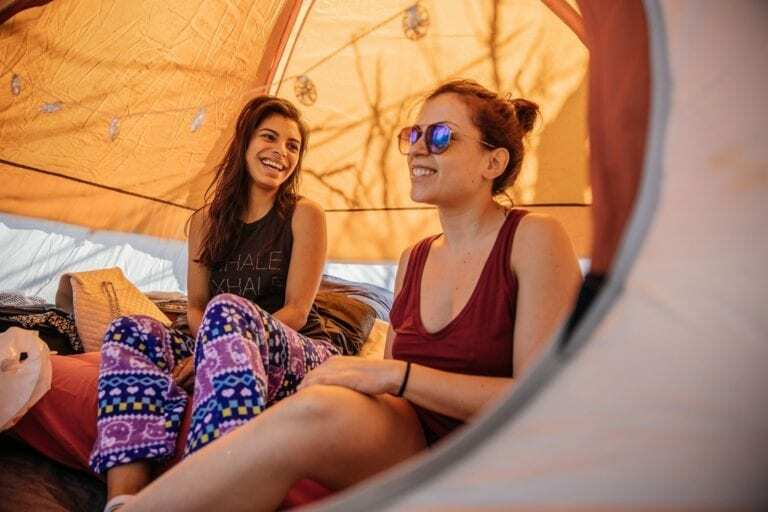 Here’s why you should bring a friend to Wanderlust. Going to a yoga festival is already unforgettable, but going to a yoga festival with one of your best friends? That adds a whole other layer of magic. From planning to practicing, everything is an adventure and having a right-hand pal transforms your experience into a shared experience. I remember turning down the long, winding road into the Wanderlust Squaw Valley festival with my dear friend Sarah, pine trees towering over either side of us. We were growing giddy before we even got to the sign-in tent. The second we stepped onto the gondola (a pile of luggage and two yoga mats in tow) and started the journey up the mountain to our campsite, I knew we were in for a special adventure. Over the next four days and five nights, Sarah and I would flow under the sun, dance under the stars, laugh endlessly, cry a few drops, unravel new and beautiful layers our friendship and of ourselves. Let me start by saying that the kind of friend who is onboard to fly across the country, pitch a tent on the side of a mountain 10,000 feet above altitude and do a staggering amount of yoga by your side, is the kind of friend you want for life. These are the ride-or-die pals and the ideal person to bring to a festival. From planning our schedules to pitching our tent, everything that could have been routine was transformed into a bonding experience. A bit about us: Sarah and I have so much in common that it’s sometimes like hanging out with myself. In other ways, we are totally different, and that’s special in it’s own way. While she went off to do an epic trail run up a mountain, I was deep into an emotional Sean Corne flow. And when Sarah left for her SUP class on Lake Tahoe (Friend brag: She nailed her headstand on a paddleboard! ), I was circling up in a cacao ceremony at the base of the mountain. We didn’t stop one another for having our own personal moments. We supported our differences. Yet no matter where we went, we always managed to take a daily class together. It was important that we find the time to look across the mat and say, “Hey pal.” In the evenings, we had endless stories to swap and share about what all we had done, seen, and learned. We shared tips on how to quickly get from one area of the festival to the next, which teachers to see, our favorite artists to hear, and the best foods to eat. We made new friendships in addition to strengthening our own. No matter where our respective days took us, I came home to my friend to say goodnight. That being said—it wasn’t all perfection and stretchy pants. Festivals can be draining, and any form of travel demands going with the flow at one point or another. For instance, we brought a blow-up mattress to high-altitude camping. Oops. But nonetheless, we figured it out. We had hauled that thing all the way from Texas, up the mountain, and then over to the first aid station where we used their power outlet to blow it up. That night, we slept with comfort and pride in our ingenuity. On the last night, a windstorm tore through the campsite and nearly blew our pristine tent right off the side of the cliff. After a day of attempting to salvage the situation using copious amounts of duct tape, rocks, and imagination, we eventually had to abandon our spot. Sarah came through and saved the day, finding us another cozy spot to sleep and continue enjoying the magic of the festival. That experience cemented her as one of my go-to friends in life—I needed her! In the end, our troubles were washed away as we danced under the stars to Beats Antique and Magic Giant and nourished ourselves with endless amounts of sauteéd kale, acai bowls, and coconut ice cream. Having a friend helps you navigate life’s tricky moments and savor everything delicious. A yoga festival can feel totally surreal. The good vibes are almost palpable and the energy is glowing. In this state, there’s nothing better than standing in the middle of hundreds of yogis and looking over your shoulder to see your best friend experiencing the same insane moment alongside you. It reminds you—I am not alone. You are gifting your friend with your presence, and she with hers. There are so many of these incredibly special, “you-had-to-be-there” moments happening all the time, all around you and when you’re with your friend, you don’t have to try and describe them later, because they were right there with you. Wherever you’re at in life, whatever you’re facing, working through or working on, going to a festival is like having your soul jolted back to life. There is something magical in the air or the water or the people—or maybe all three—and I would absolutely do it all again. In fact, I just did. A few weekends ago, I took my mom to a Wanderlust 108 and it was equally incredible sharing the wild and wonderfully weird experience with her. We cruised through a 5k, cried together at Chelsey Korus’s insanely inspirational yoga flow and meditated under the beaming sun. And when all that was done, we dabbled in some AcroYoga, hula hooping, shopping, and good, clean grub. I saw my mom uplifted, feeling brave and strong. That made my heart want to explode. Ah, the magic of the shared experience.